In this article I’ll show you how to implement a “combo box” with key-value structure as one of ALV columns. 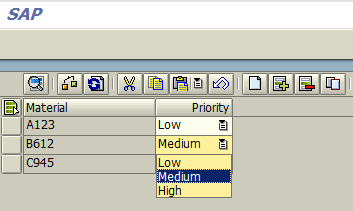 It can be considered as an easy task but you would be facing an unexpected problem in ALV which will display KEYS instead of VALUES of the combo box. If you select a value from the list, it will be displayed correctly until you press enter (in case you have the Enter event handled) or you refresh the grid. After refresh keys will be displayed again instead of values. 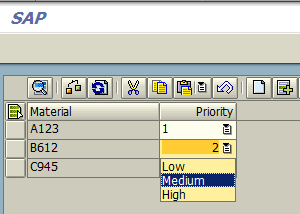 I’m not sure if this is a bug or a “feature” in SAP, but in my task I needed to have KEYS hidden in the combo control and display the VALUE (understandable text) to the user. 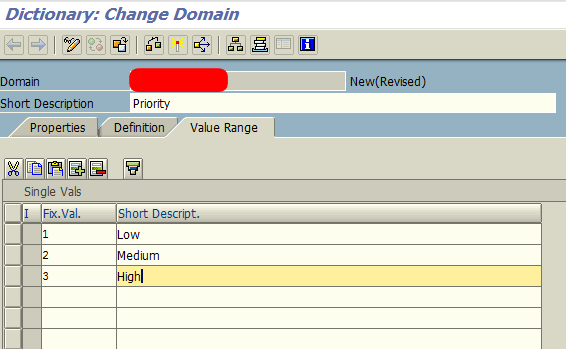 This was necessary because I had to display “Short text” description of selected DDIC domain value. lt_dd07v TYPE TABLE OF dd07v. LOOP AT lt_dd07v ASSIGNING <ls_dd07>. APPEND INITIAL LINE TO rt_dral ASSIGNING <ls_dral>. WITH KEY ddtext = input. WITH KEY domvalue_l = input. You can donwload complete source code of Z_ALV_DROPDOWN right here. This entry was posted in ABAP, ALV, Development, Dynpro and tagged ALV, combobox, conversion exit, DDIF_DOMA_GET, dropdown by Spider. Bookmark the permalink. Thanks for having this not-sucky ABAP guide. You are a refreshing break from SCN. only if you has changed the initial value, or if you add a new line. The values in this list are clered.